Is your reason for communicating hiding in plain view? Can you see the snow leopard in this picture? It's in the centre. Snow leopards are rather spectacular, yet the camera shows us that they can also hide in plain sight. How clear is your purpose for communicating? The most common problem I uncover as a communication coach is that people haven't really thought through what they want. 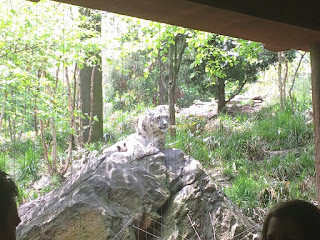 Like the snow leopard, their purpose is in the picture, but it's not easy to see. The single most important thing you can do to improve your writing or speaking is to decide before every communication: what do I want to change in my reader or audience? What do I want them to think or do differently because I communicated? And then ask: "What will that get me?" Repeat the question until you're sure you've come to the deepest, best outcome for the email or blog post or presentation you are preparing. If you're reading this post, I know you answered yes to the title question. The truth is that everyone gets frustrated some of the time. It's that feeling you get when you are anxious to move forward and you're not, or when you've let someone push the same button for the thousandth time, or when you hear the voice in your head telling you that you deserve the roadblocks you're facing. But here's a different question: are you finished being frustrated yet? And the answer to that might be more complicated than you think. You might want to hang in there with your frustration until it gives you a strength or an insight that you need. This connected for me with a coaching session yesterday, where I was working with a client preparing a short presentation. In the presentation he sometimes used the pronoun "we" to refer to his team, and sometimes used "we" to refer to his team and the audience combined. I imagine this kind of confusion is quite common in organizations, where "we" covers a lot of different units of meaning.